Well, hello there! It’s been a while. On my first post I gave a short insight on the Character Design for our two little friends, Bismo and Plom. A few months have passed since then and the world of Mercury Shift has grown along with its characters. Feel free to check out the video, which shows all types of different animations that have been developed up until now. Of course there’s still more to come in the future and a few more things I’d like to show you in this article. Firstly, I’d like to show you the current design for our characters. It hasn’t changed that much in the over-all, but we are constantly working on details to make the two of them even more mercuryblob-like. We gave them a nice rim light, more glossiness and reflectivity. Our plans are to vary the reflection maps depending on the stages to convey the impression that the stages’ outlines are truly reflecting on Bismo’s and Plom’s skin. When it comes to Character Design and Development, the definition of story and personality seems to be the most important preset. When it comes to story regarding gameplay though, there are a few questions that come to mind. How important is the story to our game? In what extend is a story needed to create experience and fun? How important is the story to the gameplay itself and the other way around? What does all this mean for our Character development? Here are some answers we found. Mercury Shift is defined by its fun gameplay and coop experience. The characters or at least their abilities are defined by the gameplay too. So we decided to keep the story simple and short and have the player experience it along with the gameplay. Of course, if a story is not explicitly shown, it becomes more important to have it conveyed through the characters and environment. Therefore you can find little hints to the story in MS3D every here and there by just looking closely. 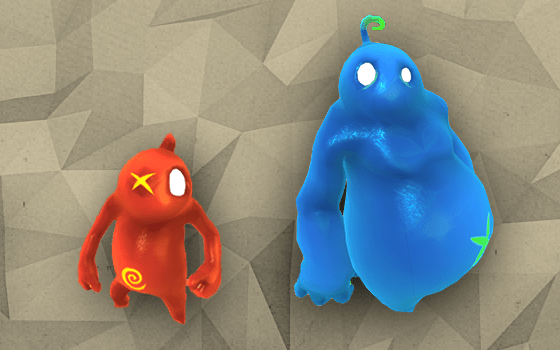 Bismo and Plom were created during an accident in a laboratory involving mercury and orange juice. Although they are not actually fluid in a whole, their liquid form shines through from time to time hinting at their original substance. Take a look at the shift for instance. While shifting their body becomes silverish and fluid enabling Bismo and Plom to exchange masses. Likewise the Player Death: When our Characters touch with a hostile object they lose their solid substance and turn back into little mercury puddles. First is to imagine how a big, heavy character would move and how a tiny, speedy one would. What are typical motions for each? Second is to remind oneself of the different personalities of either Bismo or Plom. What are their character-traits and how can they be depicted in an animation? Last is mixing it together considering both aspects. Here’s an example how the resulting animations can look like (run animation). One more thing that should not be forgotten is the fact that the different abilities they have do not vary depending on the characters themselves but do vary depending on their sizes. This sets a natural focus on the aspects of “Big” and “Small” rather than on the different characters and their distinct personality. This is not a bad thing though since for the gameplay it is important that the abilities of our characters are understandable without greater effort. The story and individuality of Bismo and Plom can still shine though. Little details and idles do the magic, giving them the space to show off who they are. This entry was posted in Art department, Character and tagged 3D Animation, Animation, Character Animation, character design, Mercury Shift, Mercury Shift 3D. Bookmark the permalink.